This coloured aquatint was made by Robert Havell and Son from plate 9 of JB Fraser's 'Views in the Himala Mountains'. The Gurkhas' steady southward movement inevitably brought them into conflict with the forces of the British East India Company, which was expanding northward into the Ganges Terai and Himalayan foothills. Fraser's brother, William was a British political agent whose mission was to move through the Gurkha-held territories of Garhwal, helping to consolidate British influence with local chieftains during military campaigns. 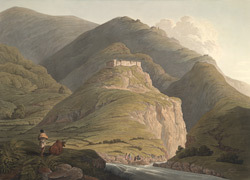 The fortress at Raeengarh was perched on a bleak ridge, overlooking the river Pabbar, a tributary of the Tons. It was in the little principality of Rawain and therefore under the control of the princely state of Bushair. One of the last strongholds of the Gurkhas, it was important that the British gain it. James Fraser described it as "perfectly calculated to resist storm".